On Friday, December 2nd, 45 King’s DECA students and six mentors embarked on the trip of a lifetime. Everyone boarded the plane and buckled in for the five-hour flight to New York City, excited to finally see the “City that never Sleeps”. 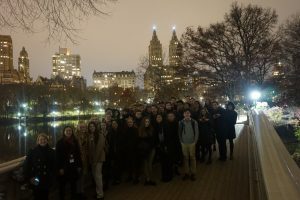 As soon as the plane landed, the group got on a bus and was greeted by a view of the city and information from New York expert Mr. Ruhlman. Students learned about different architectural structures and history of the many areas while coming into the city. Bus rides are ok, but on this trip, students got to experience something even more magical-the subway. That day, everyone visited famous landmarks such as the New York Library and Grand Central Station. However, that was only the beginning. Trekking on foot for nearly 45 miles over the course of the trip, students explored Times Square, filled with giant screens that lit up the city. Everyone enjoyed a night cruise and view of the dazzling lights and historic Statue of Liberty. 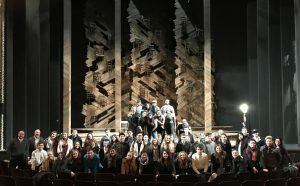 Many watched what was their first ever Broadway performance and were also able to go backstage to meet the actors and talk about relevant world issues. 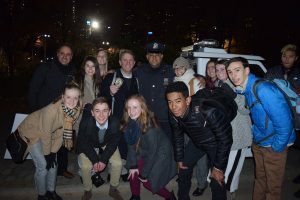 The group did not just experience the theatrical side of New York, however. Later, students visited King’s alumni Hadley Ma and several Wall Street experts to learn firsthand what business in New York entails. Lastly, a stunning performance by the Rockettes brought a close to the spectacular trip in New York. As the plane landed in Seattle, King’s DECA students were happy to be home. And yet, there will always be a special place in our hearts that longs for the hustle bustle of New York.